As the major media narrative had it, Donald Trump’s nomination as the GOP presidential nominee would sink the Republican Party. The GOP would lose the Senate, possibly the House and suffer defeat after defeat right down to the state level. But team Trump saw what the media refused to and rode an anti-establishment wave to the White House. The President-elect’s long coattails also preserved the Senate for the GOP and helped the party gain its largest-ever majority in state legislative chambers. Democrats lost their last legislative chamber in the South when Republicans won control of the Kentucky House of Representatives. “Anyone who said that Donald Trump was going to be a drag on down-ticket races is certainly eating their words right now,” Lisa Nelson, CEO of the American Legislative Exchange Council (ALEC), told CNSNews.com. Republicans are now in control of a record 67 of the 98 partisan state legislative chambers, more than twice the number (31) in which Democrats have a majority, according to the bipartisan National Conference of State Legislatures (NCSL). Now, it is the Democratic Party that is in tatters, reduced to levels of control not seen since the Civil War. 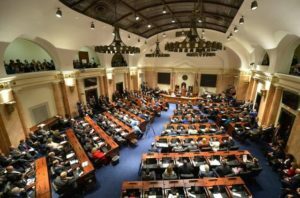 Democrats lost control of their last legislative chamber in the South when Republicans took control of the Kentucky House for the first time in nearly 100 years. In 2010, Democrats in the Kentucky House held a solid 65-35 majority. Six years later, the GOP now has a supermajority, and will control 62 of the chamber’s 100 seats. “Democrats are now basically extinct in the South,” The Washington Post’s Amber Phillips noted. Republicans in 2017 will control both legislative chambers in 32 states – an all-time high, according to NCSL – while Democrats will have total control of just 13 state legislatures. The GOP also will have the “political trifecta” in 24 of the 32 states with Republican-controlled legislatures, where voters have also elected Republican governors. Democrats have the trifecta in just six states. Since 2009, when President Obama took office, his party has lost a total of 919 seats in state legislatures nationwide, according to NCSL data. The Democrats’ prior advantage in the nation’s governors’ mansions when Obama took office has also been lost. There are currently 31 Republican governors, 18 Democratic governors and one Independent (Gov. Bill Walker of Alaska). “Republicans grabbed more of America’s statehouses and governors’ mansions during the Obama administration than at any time in the modern era,” Phillips said.